Earlier in the year, the more than occasional baker made an apple cake using Wensleydale cheese with added cranberries. Well, I was intrigued by this and her description had me bookmarking the recipe immediately. As with most of the recipes I bookmark, it’s taken me some time to try it out, but try it out I eventually did. The Wensleydale I used was one studded with cherries. With my recent discovery that chocolate and cheese go very well together I also added some chocolate, but this could of course be left out if it is deemed to be overkill. I was recently sent a few Fairtrade goodies from the Fairtrade Foundation and I was keen to try them out. Placed 150g unsalted butter in a bowl and left it on our storage heater for an hour to soften (the kitchen has gone into it’s no need for a fridge phase). Sifted 175g flour (half white, half wholemeal) into a bowl together with 1 tsp baking powder. Peeled, cored and chopped 1 large tart apple (unidentified Cornish variety) and tossed into the flour ensuring all surfaces were coated to prevent browning. Chopped 50g of Traidcraft dark chocolate (70%) into chips. Crumbled 125g cherry Wensleydale cheese into small bits. Creamed the butter with 175g golden caster sugar until it was really pale and fluffy. Folded in the flour and apple, mixing in 3 tbsp milk when the mixture became too stiff. Gently stirred in the chocolate and cheese. Spooned into a 2lb loaf mould. 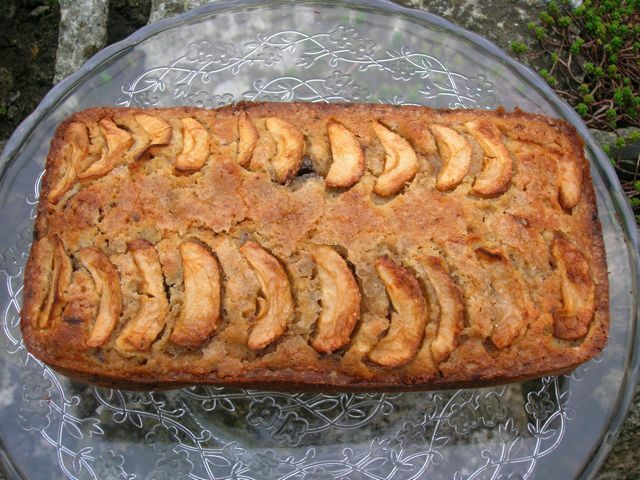 Cored, peeled and sliced a small tart Cornish apple (variety unidentified) and laid over the cake. Sprinkled over 1 tbsp demerara sugar and baked at 180C for 45 minutes. Allowed to cool for 10 minutes before turning out onto a rack and cutting a slice immediately! The cake looked so tempting with its shiny toffee apple top that I couldn’t wait for it to cool, so I cut a slice whilst still warm. The smell of cheese on toast as I raised it to my lips was slightly disconcerting, but luckily this didn’t put me off. It had a fantastic texture and good flavour, sweet with little bursts of saltiness courtesy of the cheese. As the cake was quite sweet, this worked really well; together with the tart apple and bitter chocolate almost all taste sensations were covered. I’m submitting this to Jac’s Bookmarked Recipes over at Tinned Tomatoes. This looks wonderful, a great combination of flavours, I must give it a try !! This looks fantastic. I can smell it from here. I may in turn book mark it! This cake definitely has two things in it I like very much!